Jonathan Ames on stage entertaining the crowd with feats of derring-do during the Jonathan Ames Show. 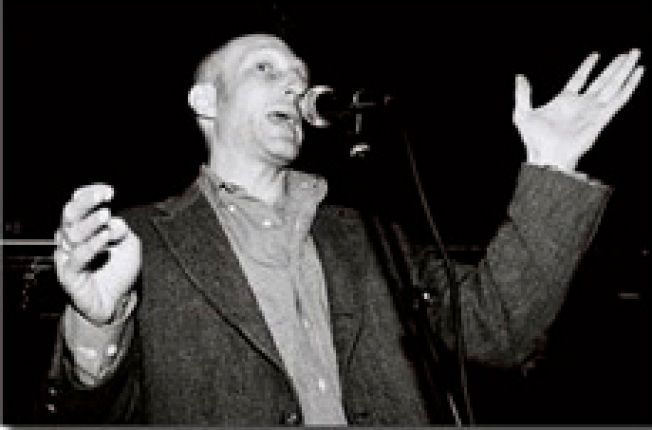 Jonathan Ames is an author, journalist, half-hearted comedic storyteller, frequent Letterman guest, former managing editor of the New York Press, former human punching bagamateur boxer, former professional liquor receptacle, former host of variety entertainment at Mo' Pitkin's House of Satisfaction, and now a graphic novelist. His first graphic novel, "The Alcoholic," illustrated by Dean Haspiel ("The Quitter"), recounts the sordid story of a post-blackout day in the life, where our hero agonizes over his past misdeeds and failed relationships — sort of like "High Fidelity" if it were a comic strip about drinking (so not at all like "High Fidelity"). As part of the West Side Y's Writer's Voice series, Ames will be reading at the newly refurbishedMarjorie S. Deane Little Theater this Friday at 7 p.m. And for free, so go (though a donation of $5 is suggested). Ames, of course, won't be reading from "The Alcoholic", because it's a comic book and that would probably be stupid and boring, but instead will read from his previous novel, the P.G. Wodehouse-inspired "Wake Up, Sir."